Have you ever wondered if you could make your own wood stain? Do you love to build or are a wood worker wanna be? Are house projects calling your name? I learned how to Make Wood Stain and I think you’ll love the results! I built a mirror frame and decided to try homemade stain to avoid the lingering smell of store bought stain. I found this article and set to work! The goal was to see If I could make a stain that looked rustic. We tried out a few variations and held them up to our wall to make sure it would coordinate with the paint color. It was a fun experiment and we are quite happy with the outcome! Apple Cider Vinegar – I used Bragg’s, the good stuff, because it’s what I had. Put steel wool in a jar. Cover with White Vinegar or ACV, depending on your color choice. 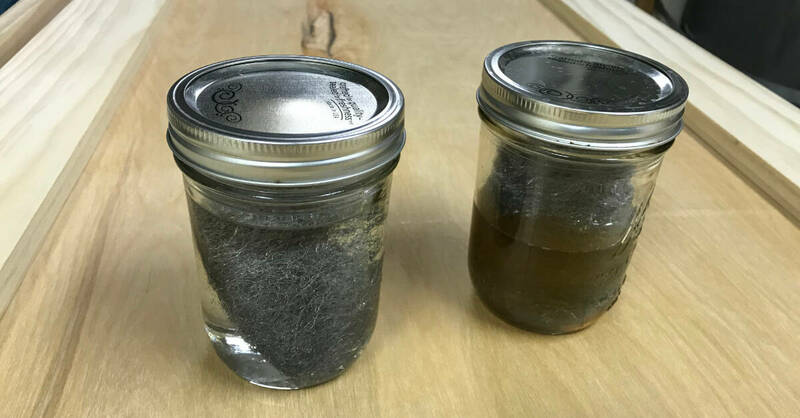 Remove steel wool from jar. I used two old forks to do this. If you make stain with both White Vinegar and ACV, label each jar as White Vinegar or ACV. Don’t forget this step! It may seem like it’s obvious but, over time, it will be hard to tell them apart. Steep 8 tea bags in 3 cups water. I let the tea bags sit all night and removed them the next morning. Not sure if that makes any difference at all. This tea mixture, by itself, will not add color to the wood. It does increase the intensity of the vinegar solution you choose. I used select pine for this experiment. Colors will vary depending on the wood you use. If you prefer the intensity tea brings to the wood, start with the tea mixture. I suggest using a rag to apply the tea. Because the tea does not give color to the wood, it is difficult to see where you have put it. For our mirror frame project, I used a paint brush to brush on the tea. After applying my vinegar stain, there were light spots on the frame where I had missed putting tea. Using a rag will help you apply the tea evenly. After the tea is completely dry, use a rag to rub on your vinegar solution of choice. Apply the vinegar solution in a well ventilated area as it does get pretty potent. Depending on which color you chose, you may stop here or repeat with a second coat of vinegar solution. I have to admit, I thought this whole thing was a dud at first. It didn’t seem like the vinegar solution was doing anything. After it sat for a bit, I realized this could actually work! It’s really quite amazing that wood can be stained with just a few simple household products! Of course, colors may vary for many reasons but this will give you a good idea of which direction you want to go. I found the ACV solution to have a greenish tint to it and chose the tea + 2 coats of White Vinegar solution to use for our mirror frame! We love the way it turned out! The only smell lingering here is from the mirror glue we used to adhere the mirror. 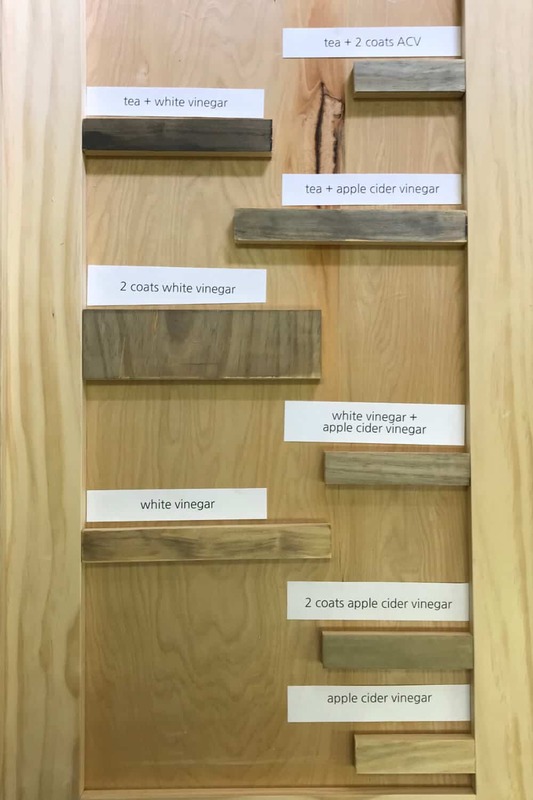 Who knew you could stain wood with vinegar? 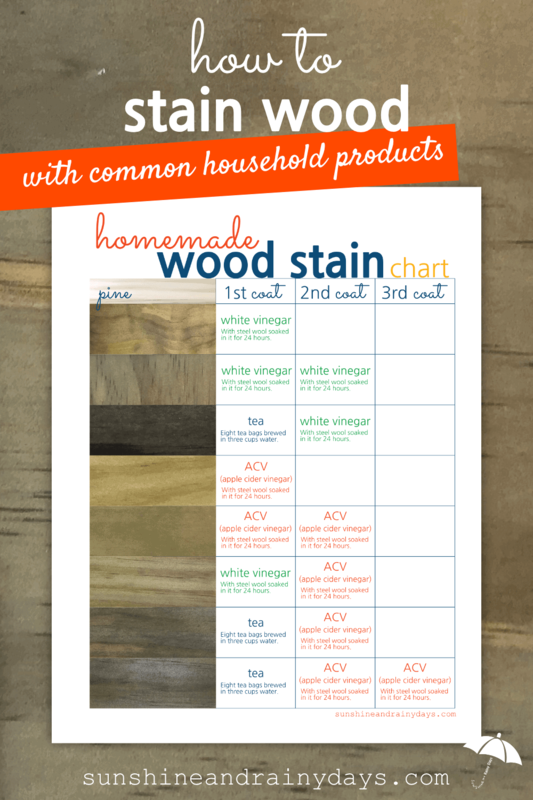 Get the homemade Wood Stain Chart here! 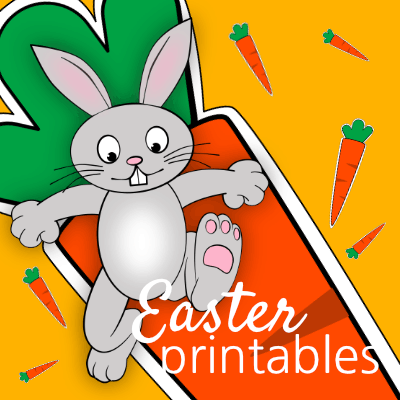 You will also receive weekly emails with new printables, project ideas, or musings!